It’s Honda Indy week in Hogtown and auto writers are busily filing stories while filling up on freebies. 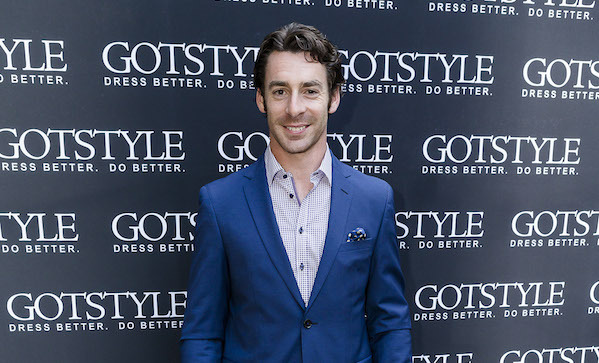 Sand Copenhagen has arranged to host a party featuring the very hot driver, Frenchman Simon Pagenaud. At thirty years old, Pagenaud is enjoying a banner year with Grand Prix wins in Houston and Indianapolis. But older readers of DailyXY may remember their thirtieth birthday as the time when they couldn’t fake it any more. They had to start watching what they eat and exercising more. Sure, they can lie to themselves and say that forty is the new thirty, but 190lbs will never be the new 160. Racing drivers are elite athletes. Pagenaud and I discussed how he stays physically and mentally fit for Indy racing. DailyXY: What is your regular exercise regime? Simon Pagenaud: Driving an Indy car, we don’t have power steering. And those ‘wings’ that you see on the car, it’s like a plane upside down. It’s about 5,000lbs of down force. The force you’re going through in the corners is really strong. So there’s a need for a lot of core strength; a lot of work in the gym—so I do lots of cardio, lots of endurance training. Weeks of strength training. Weeks of endurance. You combine those two and build the strength as much as you can without building too much mass—because you don’t want to put too much weight on. [A diminutive and relaxingly confident chap, Pagenaud pauses and smiles.] And you need to be small enough to fit in the car: a tricky combination for the trainer. How often do you work out to remain race ready? We sit in the car for three hours. You need to be able to hold the correct angle for your elbows and the correct angle for your legs; so you don’t have sleepy legs, sleepy feet. So the routine is basically two to three hours in the gym five days a week and three times running—about an hour each run with a lot of interval training in it . . . I’ll cover twenty kilometres in an hour. Twenty kilometres in an hour? That’s truly running, not jogging! Yes, it’s not jogging. You gotta push your heart rate to the maximum because that’s what happens in the race car. Do you do any visual acuity exercises? Yes! It’s very important. Nobody ever asks that question. So thanks for asking that question. It’s so important. The eye is a muscle and it can be trained to improve reflexes and your field of vision. I use the ball with numbers. The ball is rotating and you try to follow the number and it helps you develop the muscles in your eye. You can also do distance exercises. Do you do any mental acuity exercises? Yes, every day. Racing is 70% mental. Ask any athlete, competition in any sport is 70% mental. You can push the boundaries if you know yourself really well. I’m still learning about myself but I’ve done a lot of meditation. I still do a lot of meditation and visualization and breathing exercises. Every day I meditate, emptying my mind of thoughts. How by sitting still in a quiet place and observing the breath? Yeah, pretty much. I love doing that, following the breath. I push away the bad thoughts and stress. Then when I’m relaxed, I focus on what I want to do in the next race. What did I do last race that I want to improve? And focus on who’s my competition on what I need to do to better them. I do that everyday. How long does your meditating take before you’ve emptied your thoughts and can begin visualizing? I started doing this ten years ago. Back then I would meditate for an hour. Now, after a decade of practice, I don’t need as long because it’s natural. It can be as simple as taking ten minutes at my desk. What advice do you have for young people thinking of racing? Not just racing. Anything! The world is a competition, I think. You should never give up. As long as you believe there is a chance, there will be a chance for you. This is very personal, obviously, but I believe this. It may be far away, it may be difficult to get there, but as long as you believe you will get there, it will come. Photo courtesy of Empire PR.